It was one of those serendipitous moments. With the bills stacked on the table, the checking account down to zilch, and a continuous chime of phoning creditors I received Mari McCarthy’s new eBook Your Money Matters! Use Journal Writing Therapy to Get Financially Fit Now. Perfect! Opening the eBook I expected to see lists of writing prompts coaxing me to review my judgments and beliefs about money; I found oh, so much more! We all know that to create change we need to examine the underlying issue, settle on a believable goal and map out a series of steps to attain that goal. When facing financial matters, that usually means budgets and graphs and drudgery. This is an entirely new approach! Your Money Matters is a comprehensive journaling guide and workbook. Mari coaches you throughout the process: easing you into a comfortable journaling routine, guiding you past procrastination, helping you create manageable goals, and providing the motivation to keep you going. Your journey begins with setting a schedule and deciding on the overall goal for your journal. By day two, Mari knows you are beginning to procrastinate: “Getting into the habit of a new habit is the hardest part. We may jump into something new wholeheartedly, but making it a habit is another story. Yesterday, you were 101% committed to a fresh start, but today your lofty intentions were derailed by a million little things.” So your first objective is to become intimately friendly with your journal. “When your journaling is no longer an obligation, when it has become a pleasurable everyday practice, then it can become your most powerful personal resource for success.” She shows you how to ease into this new relationship and offers tips for keeping it fresh. By page eighteen you’ve set sail. Working your way through chapters titled Courage, Confidence, Vision and Abundance you will face your inner demons, set your intention, chart your path and gain control. Mari guides you through setting SMART goals (Specific, Measurable, Attainable, Relevant, and Time-bound), staying accountable, and measuring your improvements. She offers tips on what to do when you are not progressing and how to keep yourself from feeling bogged down. Intended as more than just a workbook to go through once, Your Money Matters actually trains you to use journaling as a life-tool for managing your money and bringing forth the abundant life that is waiting for you. I’m eager to work my way through the rest of Your Money Matters--in fact, I suggested to my partner that we might try some of the exercises together (because I just can’t see him journaling on his own). Mari gets two thumbs up from me! Your Money Matters! 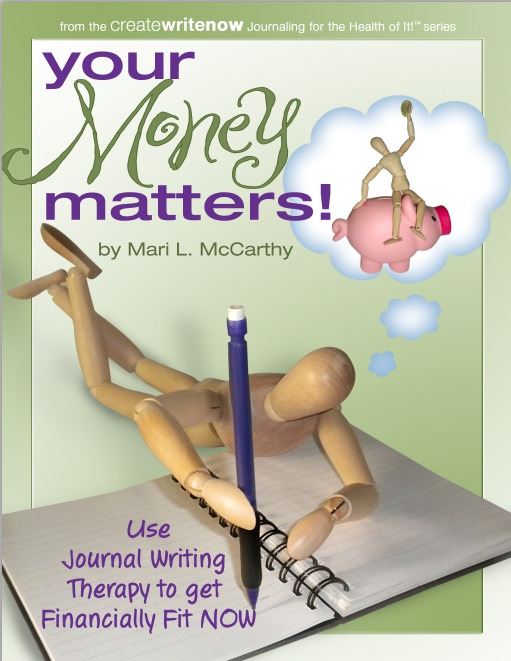 Use Journal Writing Therapy to Get Financially Fit Now by Mari McCarthy (32 page e-book) is available at Create Write Now. It will be in preorder for $5.97 from July 7-July 14, and be released for $9.97 on July 15.